1) People can tell your business is filtering the reviews. 68% of consumers trust reviews more when they see both good and bad scores (Econsultancy, 2012). Customers are more review savvy and can spot when things look too good to be true. 95% of consumers suspect censorship or faked reviews when they don’t see bad scores (Reevoo, 2015). 2) It looks fishy, like your business has something to hide. 30% of consumers assume online reviews are fake if there are no negative reviews (Webrepublic). Only 8% of consumers expect a business to have a 5-star rating before they will consider using them (Brightlocal, 2016). If there are only five star reviews on a review site, customers know that your business is grooming your reviews and assume it’s because your have something to hide. 3) Reviews that are removed will only anger customers trying to share their experience. If your business doesn’t allow or encourage reviews, your customers that have something to say, good or bad, will find it odd that they can’t leave a review for your business. Customers can still leave reviews for unverified listings and profiles so just because your business can’t see the bad reviews, it doesn’t mean they don’t exist. 4) It looks like your business doesn’t value customers enough to win them back. If your business doesn’t allow for feedback, it appears to customers that you don’t really care about them or value customer service. If customers can’t expect good service, don’t expect them to want to visit your business. Customers like to see businesses that are open to feedback and especially the businesses that are listening enough to try to win customers back. 5) It doesn’t give yours business an opportunity to win back their trust. If a review isn’t published, it can be very infuriating to customers. If your business did fail the customer, it gives you a chance to win them back. Since your business is responding to the reviewer publicly, your business can possibly win them back as well as show other customers that you care about how you treat your customers. Customers like that. 6) Businesses are missing out on valuable feedback to improve. While customers at times can be unrealistic with their expectations from a business, some can provide feedback on possible oversights. Oversights happen to the best of us and there is always room for improvement. 1) When the review contains graphic material or inappropriate language. If the review is inappropriate, contains explicit language or graphic material. Fortunately, many review sites are all over this, but if they happen to miss it, you can flag it as inappropriate. 2) When reviews are irrelevant to your business. 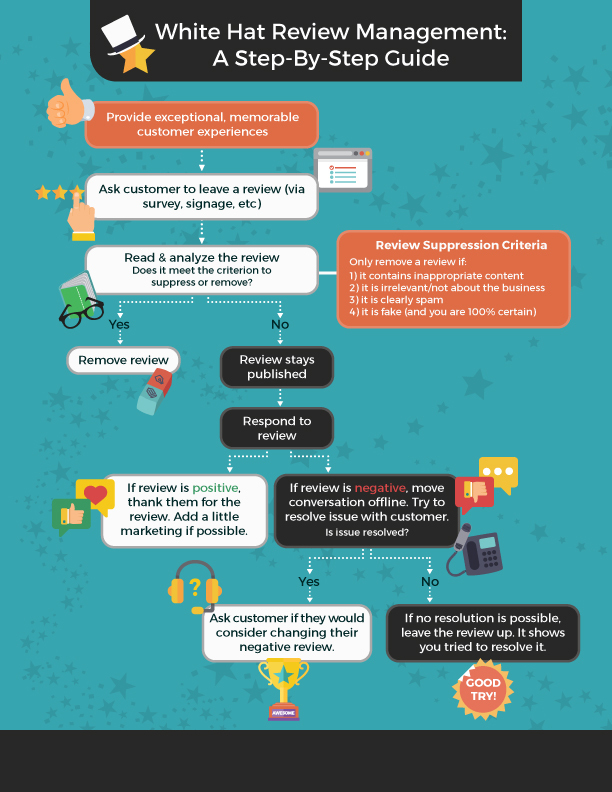 If a review doesn’t provide any mention or context to your business, products or services. Sometimes customers leave reviews but they really want to ask a question. If it really doesn’t add context as a review from a customer, it is okay to suppress that review. 3) When reviews are spammy or someone is plugging another business. 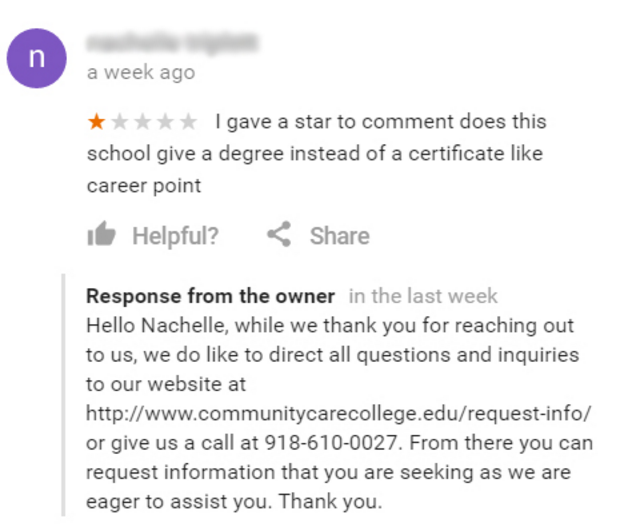 If a review isn’t related to your business but is obviously spam, or if a person starts talking about their business instead of you business. In the example below, the review was for a direct competitor and was a case of mistaken identity. 4) When the review is a fake or planted by a competitor (and your business knows it is). In the case of review fraud, it is completely acceptable to suppress the review and remove it. In the example below, the person hasn’t ever been to the establishment, they just left a review that they read other reviews. Unfortunately, reviews have been used as blackmail and this sort of unscrupulous behavior does occur. The fact that this behavior is on the rise speaks to the importance of practising review management and using reputation management software. If you want help determining if a review is a fake or not, try the free Review Skeptic tool backed by research from Cornell University. 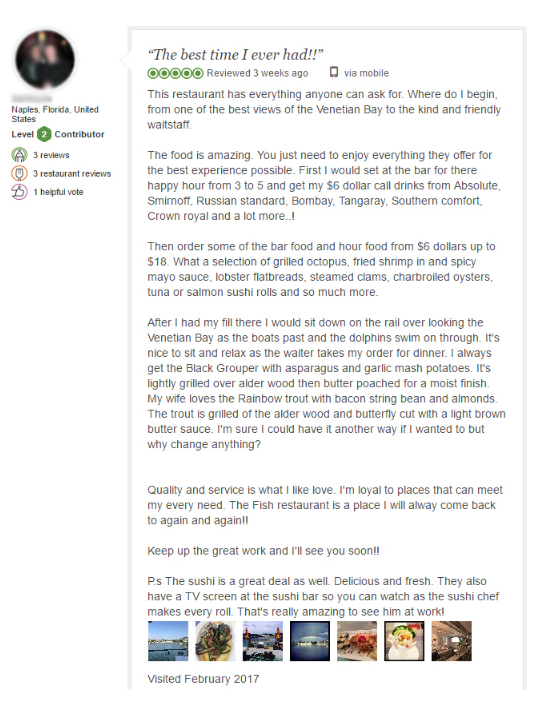 The review below is an example of a business owner promoting his own business. There’s a lot of specific detail that even the most committed reviewer wouldn’t delve into. On top of that, the review is so long many people will probably just skim over. How can your business practice white-hat review management? Read and analyze the review. Does it meet the criterion to suppress or remove? If the review is negative, try to move the conversation offline. Try to remedy the situation to win the customer back. If you have remedied the situation, try asking them to adjust their review. If not, then at least the customer may come back. At the end of the day, people can tell that if your business is grooming your reviews if all of your reviews are too positive. From a consumer’s perspective, it is better to see a business with a mix of reviews, mostly positive but with some negatives as well. So long as a business is trying to remedy the situation by responding to the customer and following the proper review management protocols, it actually says more about the business than a business with all perfect five star reviews.